From her perch high atop the factory floor, she pulls red and white stripes through her hands over and over, being careful to keep the seams neat and tidy. Always a perfectionist, she is even more prudent here. This isn’t just any flag – it’s Old Glory. 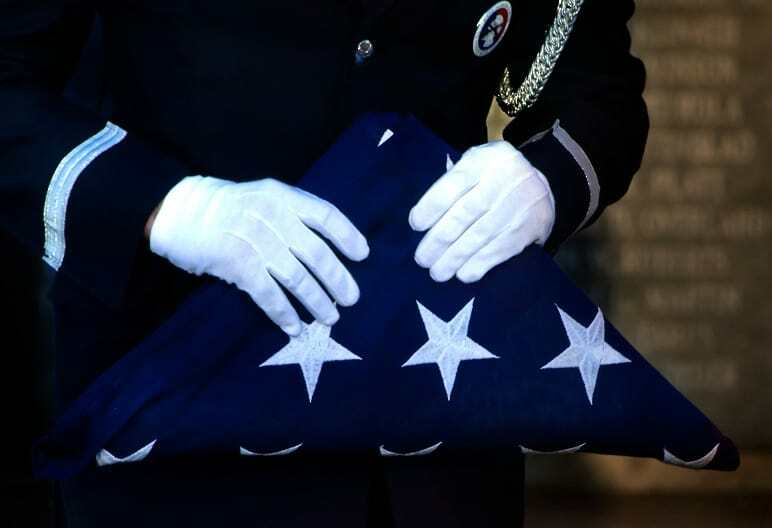 And this isn’t just any version – it’s an interment flag to drape a veteran’s coffin, one last embrace from a grateful country. Contrails of sweat arc through the air as a football player slams his opponent into the wall, the momentum carrying him over the four-foot barrier and nearly into the nacho-laden laps of a family of four. Fans leap to their feet and pump their fists to a chorus of “Who let the dogs out? Woof! Woof!” With a triumphant grin, the airborne player vaults over the wall and plants his feet firmly back on the green Astroturf as a parade of silver-clad women shimmies into the end zone. Football is the main event on this Friday night, though religion is a definite subtext – with a Bible giveaway, a Christian concert, and, controversially, football players wearing jerseys with biblical references. The smell of fried catfish wafts across the wide front porch, up to the beadboard ceiling and then down, past the white clapboard walls and out beyond the cracked sidewalk to 30th Street. At the edge of the porch sits a gaggle of girls, swinging their feet in rhythm with the steady buzz — 15-year-old Ken Davis is getting a haircut, and on a Sunday afternoon with nothing better to do, this is the height of entertainment. If you weren’t looking for Panola, you’d never find it. It’s like a thousand other small towns across the South – an accidental detour on the way to somewhere else. Seventeen miles from a Snickers bar or a Coca-Cola, Panola is beyond rural – it’s practically forgotten. Things might still be that way if it hadn’t been for the church fires – 10 in eight days last month across five different Alabama counties. Three Birmingham college students were arrested in connection with nine of the fires last Wednesday, but healing will take a long time in Panola, where Galilee Baptist Church was one of the last to burn, completely destroyed on Feb. 7.